Canon EOS 70D is an APS-C sensor DSLR camera released in 2013. 70D is the successor of Canon EOS 60D. For lowest price, you can buy Canon EOS 70D here. Today, this article will talk about several recommended lenses for Canon EOS 70D. This time DxOMark tested over 100 lenses for Canon EOS 70D, and below is the best lenses for your 70D. 50mm standard prime lenses are very popular, one of the must have lenses for Canon EOS 70D. The new announced Sigma 50mm f/1.4 DG HSM Art lens is the best 50mm lens for 70D. The another good choice for Canon EOS 70D are EF 50mm f/1.4 USM and Sigma 50mm f/1.4, both at an affordable price. If you looking for more expensive lenses in order to get better images, you may try Zeiss 50mm f/2 macro lens and EF 50mm f/1.2L lens. For the 85mm, 100mm, 105mm, 135mm portrait lenses, besides two Zeiss high price lenses, the Sigma 85mm f/1.4 EX DG HSM lens is your best choice for Canon EOS 70D. And for a cheaper price, the EF 100mm f/2 and Samyang 85mm f/1.4 are both great lenses for Canon EOS 70D. And the Zeiss 135mm f/2 Apo Sonnar T* ZE lens hasn’t tested yet, but it should be a great portrait lens for 70D. And the new released Samyang/Rokinon 135mm f/2 ED UMC lens is a cheap and good lens for 70D. If you are choosing a standard zoom lens for Canon 70D, it is clear that the EF 24-70mm f/2.8L II USM is the best choice for image quality. And if for a cheaper price, the new released Tamron SP 24-70mm is another great choice for Canon EOS 70D. EF 24-105mm f/4L is always a kit lens for Canon DSLRs, price as low as $700. For other 17-50,55mm Standard zoom lenses, the Sigma 17-50mm f/2.8 EX DC OS HSM lens is a great lens for Canon EOS 70D. In this range, the best 70-200mm lens tested on Canon EOS 70D is the Tamron 70-200mm f/2.8 lens. Even better than EF 70-200mm f/2.8 IS II USM lens. The 70-300mm lenses are often seen as “kit lenses”. They are effectively cheap lenses that offer a decent focal length, but generally the compromises made in achieving the large focal range mean image quality suffers. The best 70-300mm lens for good image quality is EF 70-300mm f/4-5.6L IS USM lens. The EF 75-300mm f/4-5.6 III USM lens is another great choice compared to the price. 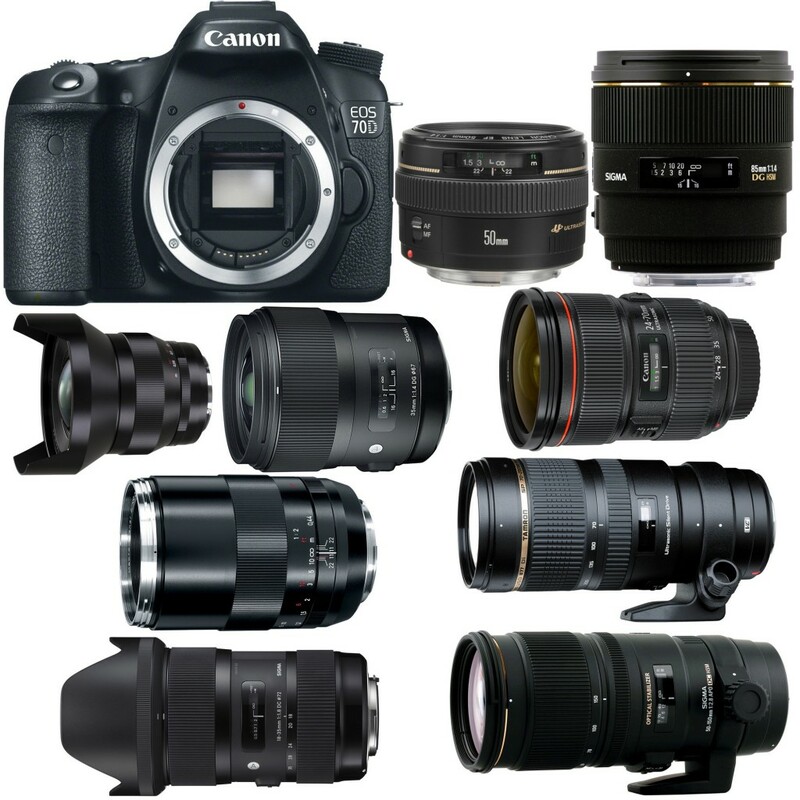 If you are looking for some super telephoto lenses for 70D, below are several best lenses for 70D. The Sigma 50-150mm f/2.8 lens is a great APS-C lens for 70D with a not very expensive price. There are two new super telephoto zoom lenses yet not tested, but should be great lenses: EF 100-400mm f/4.5-5.6L IS II USM lens and Sigma 150-600mm f/5-6.3 DG OS HSM Sports lens. If you are looking for some super telephoto prime lenses, below are best lenses for you to choose. The EF 300mm f/2.8L and 400mm f/2.8L lenses are the best, but very expensive. If you looking for cheap one, the EF 200mm f/2.8L is one of best choice. The best Ultra Wide lens is from Zeiss. The Zeiss 15mm Digstagon T* lenses are both great lenses for 70D. If you are looking for a cheap choice, the Samyang 14mm is the best choice. Within the wide-angle prime lenses, the Sigma 35mm F1.4 DG HSM A lens and EF 35mm f/2 IS lens are the best. The third lens is the EF 35mm f/1.4L lens, which is more expensive. At 24mm range, the new released Sigma 24mm f/1.4 DG HSM art lens id another great wide-angle prime lens for 70D. Of course, the new released Sigma 18-35mm f/1.8 DC HSM lens is the best zoom lens for Canon 70D. This lens is even better than most prime lenses for Canon APS-C sensor cameras. Other recommended wide-angle zoom lenses are from Sigma and Tokina. The new announced EF 11-24mm f/4L USM lens is a very good lens, but the price is very expensive. The new Tamron SP 15-30mm f/2.8 is another great lens. It is clear the best macro lens for Canon EOS 70D is form Zeiss. Both Zeiss 50mm, 100mm lenses are great Macro lens for 70D. If you need cheap one, the EF-S 60mm f/2.8 Macro is another great lens.